The Collar is a beautiful strategy if you own a stock and have a slightly bullish view. However you also fear that the stock may fall in value. Collar strategy will help you to restrict the losses without paying too much for protection. Sometimes you can also make money if stock does not move much. Compare this to some one who owns the same stock and did not deploy the collar strategy. It is a limited profit and loss strategy. If you are bullish in nature but also fear a fall in a stock you hold – want to participate in the rally if it comes but protect losses if the stock falls, then “The Collar” is the best strategy to adopt. Lets discuss the collar strategy. The collar strategy will help you to make money if your view was right, and will help you to severely control your losses if your view was wrong. You need not put a stop loss and take your time to get out of the strategy with a limited loss and limited profit. The Collar strategy involves buying a future (or in cash the equivalent value of future if you want to do it in any stock), then to manage risk, sell a OTM (not very far) call and buy a ATM put. As you can see if your view was right and Nifty or the stock rises, the long Future will make money, but the sold CALL and the bought PUT will lose money. You must be thinking if both CALL and PUT will be loosing money then how will the strategy make money? You see the Future moves 1 point with every 1 point rise in Nifty. However bought PUT has a limited loss. And sold CALL is OTM – so yes it will lose money but not as fast as the Future making money. Overall the strategy will be in profit. Assuming you bought Nifty future and it starts moving down. If the view goes wrong and Nifty starts going down – the long future will lose money but the bought PUT and sold call will make money. However since the PUT will not rise 1 point for every 1 point fall in Nifty and the sold call has a limited profit – the strategy still losses money. But the losses will be limited as the PUT will limit the loss to a large extend. Your loss is limited to the sell price of the OTM Call minus the buy price of the ATM Put plus the profits generated by the bought Put. Lets take an example. Lets suppose Nifty is at 6000 and you feel Nifty can go up to 6300. Recently it went up to 6300 so your view. You buy a Nifty future, buy ATM Put 6000 valued at 105.00 and sell slight OTM Call of 6300 valued at 50.00. Note that you sell 6300 Call because you think Nifty will not go beyond 6300 – so why should you speculate for that and take profits for the call as well if your view is correct and Nifty does not move beyond 6300 during expiry. The profits are caped at 12250. Even if Nifty moves beyond 6300 – the strategy will not be able to profit more because the sold call will start to lose money. The losses are capped at 2750.00 because the bought Put will keep making money if Nifty keeps falling further. Now lets take the risk-reward ratio. You are risking 2750 to make 12250. This comes to risking 1 rupee to make 4.45 rupees. Isn’t this an amazing strategy? Who should play this strategy? This strategy is great for beginners as the risk is very limited but the rewards are high. This is one the best risk-reward strategies on playing Nifty futures and options. 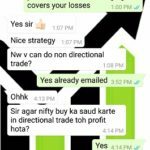 The only problem with this strategy is that if Nifty does not move in the predicted direction – you will end up wasting time and money as well. For example if Nifty expires exactly at 6000. You will not be able to make any money in the futures. But you will lose money in the options. And the total loss will be: 5250 – 2500 = 2750.00. But if 2 times out of 4 you were right – this strategy will make money over a long period of time. The Collar strategy is therefore best for risk averse traders. Also note that this strategy also works if you are bearish in view. In that case a future needs to be sold, ATM Call needs to be bought and OTM Put needs to be sold. Of course if you are bearish, you cannot play this strategy with cash. You only can play with F&O. If you take my course I have 2 very conservative but very rewarding option strategies. Interestingly if your view was right you will make money but you can also make money if your view was wrong. For more information about the course contact me. Unfortunately not many traders in India trade Collar. But frankly if you have a company’s stock in cash equivalent to its Future lot size – you can trade collars almost every month to make decent returns from your portfolio. It is a great hedge if the stock falls. And still make money if it rallies. However if a big rally comes, you may not be able to reap in the full rewards because of the sold Call option. Still its a great conservative strategy. Have you ever tried the Collar Strategy? Please let us know your experience. IN COLLAR TRADE EXAMPLE, IF NIFTY GOES TO SOLD CALL OPTION WITHIN 1 WEEK, THE SOLD OPTION WILL HAVE MORE TIME VALUE .SO WHAT WILL HAPPEN TO OUR NET POSITION. 1. You should NOT trade Collars in Index, because then you are doing it with Futures. It is only recommended in stocks because Futures has an expiry and you cannot hold it. Stocks can be held till infinity. If the stock falls, you make money from sold call – while there is a virtual loss in holding the stock. Whenever the stock goes up you can make money. But if the Futures fall you have no way other than to take a loss. 2. Your question is wrong if you bought Nifty Future and sold a call, bought a put. If the Future reaches there in 1 week, you are in profit and you can close the position. However if vega increases too much, your profits will get reduced. But when Nifty goes up, usually vega decreases – so you can close in good profit. 3. If you did the opposite – sold Future, sold put and bought call – then your question makes sense to me. In that case you are losing money but since it has happened pretty fast the bought call will appreciate in value and limit your loss. However you still lose. Why didn’t I get to read it earlier? A Superb strategy if played by the rule and I intend to practice & perfect it. Hope I do it well. Great Write Up .. My story is also somewhat same to you ( Only beginning matches so Far .. : ) I hope to match next part too ) Write now stopped trading to focus on what needs to be corrected then only will go ahead with trading . Thanks mate .. God bless you & your family .. Very nice to know you are determined too to move forward. “Only beginning matches so Far” was fun to read. 🙂 God bless you & your family too. move beyond 6300 during expiry. positions at 6300 then what will happen? remain as it is like mentioned below? Hrishikesh your calculation of profit in sold call is wrong. You have said that nifty reaches 6300 with 15 days still to go for expiry and you square off all your positions. In such a situation price of 6300 call which you sold at 50 will be quite above 50 and you will incur heavy loss if you square off. You would have to wait till expiry if you want to avoid paying the time value on that 6300 call option. Thanks for the comment. If in a Collar the stock moves fast favoring the stock (in the above case its Future buy – so Nifty moving up) and suppose it happens before 15 days are still left for expiry, then too the trade will be in profit. 🙂 Though I agree the profits will NOT be exactly as written above, but still good. How? You are forgetting that if Call will make a loss then the Future will make a profit and it will be much more than the losses of the Call. You are also forgetting that the Put will NOT be worthless at that time – so the trader will get some money back by selling the Put. In the above case Put gives him nothing. So overall the trade will be in profit though not exactly as written above. Hope your doubt is now cleared. just wanted your perspective regarding putting order . whenever i hedge may be option (only Nifty)or future hedge ( only nifty ) i do put market orders . It does cost difference of bid price , but due to fear of losing few points while time taken to put orders i prefer market orders( thought i dont like losing around .50 to 1 point in this). I want to know how you do ? can you suggest better method ? On Nifty there is not much to worry about hitting “market” when trading an order since most of the strike prices are very liquid – the ask bid difference is only 0.05 to 0.20. So in this case its OK. Problem comes in those strikes where there is a huge gap like ask 150 and bid 148. Now you have a slippage issue if you hit market. If I am a buyer I will try to be 0.05/0.10 better than the best buyer and try my luck. Similarly if I am seller I would be 0.05/0.10 better than the best seller. Like that I can get better rates. Of course this is possible if you are trading a couple of legs, but if you are trading 4-5 legs then I would suggest hit markets on liquid and try best bid/ask for not so liquid strikes. 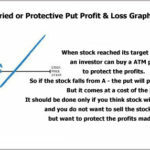 Best method to buy ATM call option and sell OTM call option in calculating way and while start profit in ATM call,then prepare to square off OTM SELL CALL before reaching strike price of sell call.OR in other way wait for expire date and before that square off ATM CALL..Some profit must be but loss is never seen. Good article. 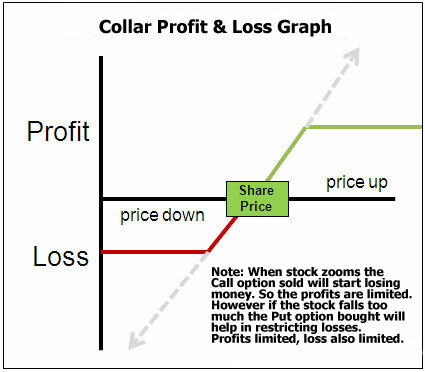 Could you also add some more detail on bearish collar strategy & profit/loss calculations for both collars. Vignesh bearish collar logic is the same – just that you sell the future and rest change the buy/sell of options. But the problem with this strategy is that you have to be correct 50% of the times else you may lose money. Its not proper hedge but good for beginners. Dear Dilip , Thanks for your response. So both bullish & bearish collar are net debit strategies, right. Also the max loss is limited with initial debit & max profit is strike price difference – net debit. Am i right.